Join MAA members on Round Top for a winter ascent of the West Ridge. 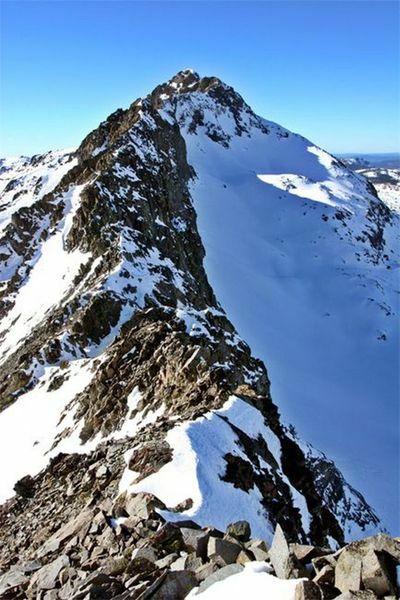 This moderate 3rd class ridge route is scenic and popular, going directly to the summit. In winter it is an adventurous route; plan for cold, windy conditions. Loaner gear may be available. We have room for 8. Hope to have you out with us! What's happening: Round Top West Ridge, Class 3 scramble, moderately steep snow, possible wind. 3 miles approach, 1,800 feet elevation gain total to summit. Route: Climb southwest to the ridge between Round Top and the Sisters. Gain the west ridge and continue to the gash just below the summit. Skirt right and descend to a Class 3 gully on the south side, then climb that to the summit, topping out by noon. Descend the same way and return to the trailhead, depart around 5 pm. Where to meet: Carson Pass Sno-Park trailhead 7:00 am. What to bring: Layered clothing appropriate for winter climbing including shell layers, snowshoes, mountain boots, ice axe, helmet, gaiters, 30 - 50 liter backpack, trekking poles, 10 essentials. Additional Info: There is a mandatory Sno-Park pass fee of $5 per day to park here, or $25 season pass.